On Thursday, February 18, U.S. Chargé d’Affaires a.i. 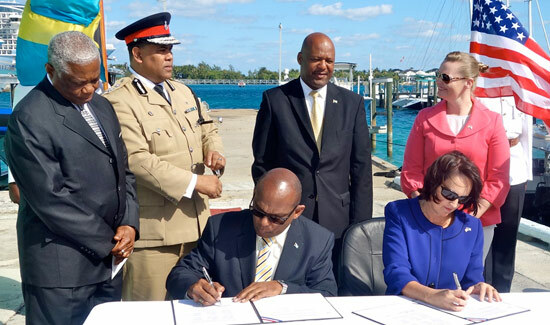 Lisa Johnson and Minister of National Security Dr. Bernard Nottage participated in the formal handover of two new police interceptor vessels built by Safeboats International for the Royal Bahamas Police Force’s (RBPF) Marine Support Services Unit. The U.S. Embassy’s International Narcotics and Law Enforcement (INL) Section donated the vessels to increase the RBPF’s capacity to participate in end-game interdiction operations under Operation Bahamas Turks and Caicos (OPBAT). The two new vessels are destined for George Town, Exuma and Matthew Town, Great Inagua. Other officials in attendance included Minister of State for National Security Keith Bell, RBPF Commissioner Ellison Greenslade, and SafeBoats International Director of Business and Development in Latin America & the Caribbean, John Hotz. In her remarks, Chargé Johnson highlighted that the United States and The Bahamas have a longstanding history of counternarcotics cooperation under OPBAT, adding that the U.S. Embassy was proud to continue to support RBPF participation in OPBAT with resources provided through the Caribbean Basin Security Initiative. With two more vessels deployed, the Chargé said she hoped to hear about additional record breaking interdictions, including in maritime operations in and around Exuma and Inagua. The U.S. Embassy’s INL Section also has provided ancillary equipment, such as boat lifts, trucks, and trailers, to support the safety and maintenance of the vessels, and has scheduled operator and maintenance training to promote sustainability in the deployment of and care for the vessels. 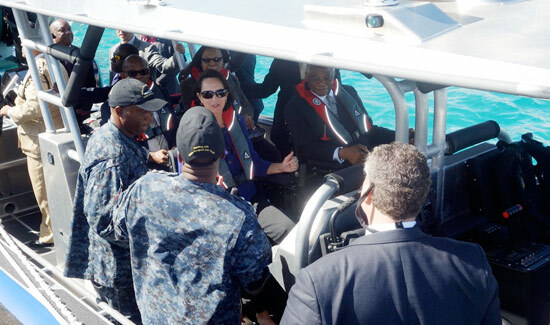 U.S. and Bahamian officials tour Nassau harbor onboard one of the 410 Apostle Interceptor police vessels. U.S. Chargé d’Affaires a.i. Lisa Johnson and Permanent Secretary in the Ministry of National Security Mr. Carl Smith participate in the official signing ceremony for the Safeboat handover as Minister of National Security, The Hon. Dr. Bernard Nottage, RBPF Commissioner Ellison Greenslade and the U.S. Embassy’s INL Director Kristin Gilmore look on. U.S. Chargé d’Affaires a.i. Lisa Johnson and the Minister of National Security, The Hon. Dr. Bernard Nottage engage RBPF Marine Unit Officers onboard one of the Interceptor vessels.